There’s been a bit of a .45 Super resurgence of late. I carry a pistol every day for self defense, but I also hunt quite a bit, and very much enjoy hunting feral hogs. I’m always looking for a pistol that can serve both roles well enough, so the .45 Super piqued my interest. First, a little on my take on the .45 Super. It’s a reloader’s round. Yes, there are companies that carry it, but ammunition is expensive and you won’t see the big benefits of the round until you tailor it for your particular firearm. I also don’t see the need for the .45 Super as a self defense round. The .45 ACP does a fine job on its own. The increased energy and penetration of the .45 Super is nice, but the increased recoil and time it takes to get back on target during a defensive gun use is not. Where is shines is in a few specific realms of competition, and handgun hunting. I was originally looking to build a 1911 to run .45 Super and I may still do that. But the GLOCK 21SF I already had was just so easy to convert that I was willing to try it first. Since most of my pig hunting is done at night with night vision optics, I need a pistol that includes an accessory rail and I prefer it to be suppressed. Almost all of my shots on pigs are at night are taken from within 30 yards. I’ve noticed a big difference in the animals’ behavior when using a suppressor. They don’t run as far, scatter as much, and half the time they run toward the gun, not away from it. Using a suppressor at night usually guarantees I get a couple of shots off on the running sounder instead of just one and done. According to my shooting log, I have just under 1,000 rounds of .45 Super through my already used GLOCK 21SF. The results have been nothing but positive. This is what I did to my GLOCK 21SF to make it reliably run .45 Super ammunition. Maybe it’s safe in your GLOCK 21. Maybe it isn’t. I don’t know your gun. Don’t be dumb. I’ve read about people loading to .45 Super pressures in barrels that don’t have a fully supported chamber. I’ve read about people shooting to .45 Super pressures with standard .45ACP brass. I’ve read about people running .45 Super a in stock GLOCK. All of that sounds really dumb. Don’t be dumb. To convert my G21SF to run .45 Super, I bought an Alpha Wolf threaded barrel, a 24lb recoil spring, and a tungsten guide rod, all from Lone Wolf Distributors. I originally went with a 23lb recoil spring, but then found a 24lb and went it with it instead. I can’t tell the difference. The total cost was about $200. Installation took less than 15 minutes and was 45 super simple. I’m shooting many of my rounds through an Advanced Armament Company .45 ACP suppressor. It needs a lot of regular cleaning and has a heck of a first round pop, but has shown no signs of undo wear. Many people run their .45 Super pistol with a compensator. This would definitely help reduce recoil, speed follow-up shots, and I imagine it would dramatically reduce the wear on the firearm for folks who intend to shoot .45 Super loads exclusively. But the muzzle flash and sound of the comp directly contradict the use I intend for the pistol. I need it to be dark and quiet. Modified like I have, the empty cases most often land a couple of feet farther away than the stock pistol shooting full pressure 230gr .45 ACP rounds. That’s an indication that there’s some increased battering of my slide going on. If the empty cases landed 10 feet away, I’d call it a no-go, but I’m good with just a couple extra feet on a gun that only shoots the .45Super on occasion. As long as I’m running a 230gr round, I’ve had no issues with reliability when shooting standard .45 ACP pressure loads in my modified G21SF. I’ve shot plenty of commercial 230gr FMJ target rounds moving at 795fps without issue. Lighter rounds, like the 185gr and 200gr bullets, often have failures to fully return to battery or won’t lock the slide back on an empty magazine. If I want to shoot rounds on the milder end of the .45 ACP spectrum or put my gun back to duty condition, switching back to the original barrel and factory recoil spring takes just a couple of minutes. As far as the ammunition itself, I’ve used only my own hand loads with several projectile types. I’ve only used Winchester LP primers, Power Pistol powder, and Starline .45 Super brass. All of my rounds have received a heavy taper crimp and they have all been loaded to a 1.230 overall length. Fortunately I’ve had a little success hunting with my converted 21SF. The first round I built for pigs was a duplication of a proven .45 Colt round. I loaded a 255 gr hard cast LSWC bullet to barely over 1,000fps. It proved to be extremely potent on the porcine pests. All of my shots were on fairly small pigs, none over 100 lbs, and all under 40 yards. With this round, I had 100% pass-throughs on pigs, at any angle. I hit a pig in the rump and it exited diagonally through its chest. That’ll do pig, that’ll do. Although not a max pressure round, the recoil on that particular round is stout, and it has proven to be more than I need. In accuracy testing, the most accurate round for my gun is a 230gr HP pushed by 8.6gr of Power Pistol to barely subsonic speeds. 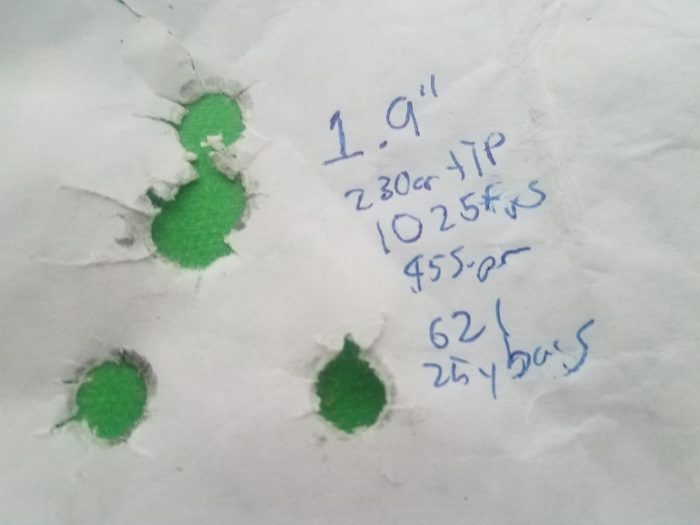 That round shoots a 2″ average five-round groups at 25 yards off bags. This is about 2/3rds the size of the better .45 ACP groups I shot through the G21SF when it was stock. Considering the accuracy of the round and the fact that it was still generating 500 ft-lbs of energy at 50 yards, I felt good about taking pigs with it at closer ranges. There’s also a bit less recoil than the 255gr rounds and it’s easier on the gun. This recipe has become the standard with my G21SF in .45 Super, and it’s what I’ve shot most through the gun. Although the pass-throughs aren’t as assured as with the heavy hard cast round, it has proven very capable on pigs at the ranges I usually encounter them at night. I haven’t taken any animal at farther than 40 yards with this gun, but I’d be perfectly confident taking a hill country white tailed deer at 50 yards. Using that 255gr round would almost certainly result in a complete pass-through on the thin-skinned game, and it’s still generating about 550 ft-lbs of energy at that range. My G21SF experiment has been a success. The conversion was fast, easy, and fairly inexpensive. The gun ended up being more accurate and much more powerful than the stock gun before the changes. We’ll see how long it lasts, but I’ve liked it so much that the now-converted G21SF has taken the place of my S&W 29 in my truck’s console. High praise indeed. You should follow the Glocktalk 45 Super thread at 90+ pages. There are some disgusting loads in that, up to 300 Grains through a 5″ barrel. Pushing a 230 grain to 1300 fps is common. I’ve always thought with a slower powder, like Ramshot or Blue Dot, and through a rifle, this well into rifle territory. 230 grains at 1800 fps would tear stuff up. I have two 45 Super rigs; a FNX with spring kit and a full modified Rock island. My fav load is 260 grain hollow point to 1040 fps with 8.5 grains of power pistol. My only disagreement? I think it’s great personal defense round. I can still maintain .50 splits with it, much like LAPD swat standard. Your favorite load is similar to my heavy hunting load, just plus one tenth of a grain of powder and 5 grains of lead more. I have read a lot of the Glock 45Super page. I can’t figure out how to load a 300 grain round without it smashing into the lands. Plus I don’t want to run a comp. As far as the 300 grainers, I can’t figure it out either. I think the OAL has to be 1.35 or something. For those who don’t reload Underwood loads are great! They have the 255 grain hard cast at 1075 fps for $21/bx. Plus their xtreme penetrator would be another option. Or, 185 grain hollow point with 694 foot pounds. The author is foolish to dismiss .45 Super as a self defense caliber, and this is the exact round I use. I also use a compensated barrel, which has no noticeable effect on either flash or sound, contrary to the author’s uninformed assumption. It is not foolish to make the decision that a particular caliber or loading is not your preference for a given task. I choose 9mm for several reasons, one being that I can get additional hits on target faster than I can with .40 or 10mm. JWT is only making a similar statement. Also, muzzle flash and additional noise from a compensator is a thing that happens. Alternator, if you can’t tell the difference between comped and uncomped at night you are both blind and deaf. Even so, it’s irrelevant, as I pointed out all of my hunting with the pistol is suppressed. Or do you also think there’s no difference is suppressed vs. comped? and it can lend moore stret creed. 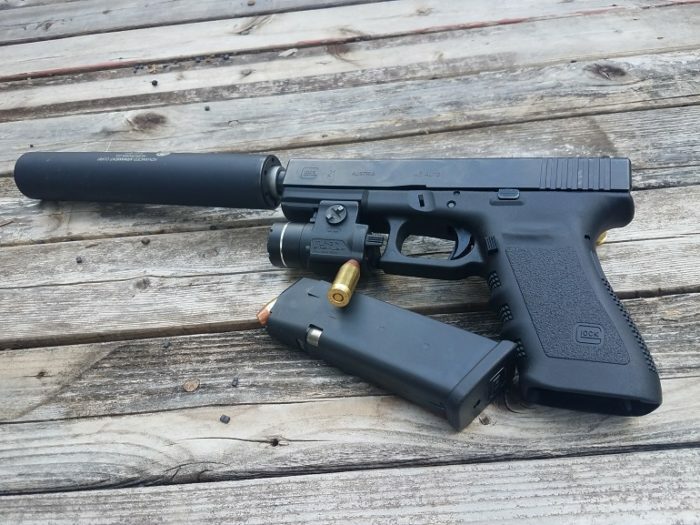 Other than being subsonic for running suppressed, is there any reason to pick .45 Super over a 10mm G20? Much heavier bullet and bigger too, larger choice of pistols and components. For the reloader, I can see no reason to go with a 10mm over the .45 Super. The .45 is bigger and heavier and provides you a wider choice in bullet weights. The benefit of the 10mm is that, with its higher sectional density, you’ll have greater penetration. But there’s no greater penetration than a pass through. You don’t get deeper than in one side of the animal and out the other. Of course, with a large frame Glocks you will get two more rounds out of the 10 than the 45. Since the 45 already has a round count that’s 13, and you can get extended 30-round magazines if you want, I find the capacity argument academic, at best. How about a 100 grain solid copper Underwood xtreme defender at 1825 fps? Or the ability to shoot 40 s&w as practice ammo? There might be a few reasons. Plus you can just buy a barrel in 10mm for your Glock 21/30/41 to convert it. There are other reasons but these are pretty cool. Cheers! But neither of those are advantages. You can run a lightweight 45 ludicrously fast as well, and you can run 45 ACP Dirt Cheap. Again, for the reloader, the 10 mil doesn’t make any sense in the Glock platform. Thanks for educating me on .45 Super, something I had apparently overlooked repeatedly in the past. I suspect it doesn’t get much traction thanks to 10mm filling similar niche, but it is a very interesting cartridge and I am now curious if I can convert some of my other .45’s with a simple barrel/spring swap without having to invest in another platform. Curious if perceived recoil between full house 10mm and full house .45Super are similar or have different characteristics. .45S seems to have a significantly lower cup pressure and if true, may have a difference in recoil velocity? I’ve never bought the idea that lower pressure equals lower recoil when the same muzzle energy is being delivered. That 230 grain round moving just under Super Sonic feels a whole lot like a good 10mm load out of a G20. I’m a big fan of the G20, but remember, even with the Lone Wolf threaded barrel, a stock G20 is just a little bit heavier than the g21. Recoil will vary with momentum (mass * velocity), not kinetic energy (mass * velocity squared). I’m aware of the math. But the principal is apparent to anyone shooting a heavy for caliber round. Even though it’s slower, it pushes back harder, the extremes not withstanding. 45 Super at this velocity, with a XTP hollow point, will grenade the bullet. At 1200 fps you’re looking at 16-18″ of penetration, but at 1300 it grenades and gets you only 11″ of penetration. You’ve lost penetration but the hydrostatic shock is over 1000 psi, which is incapacitating. Rocking the Evo 45, I see. It was my first suppressed love, and a damn versatile can with a slew of pistons and thread adaptors. My first can never. It has certainly was stood the test of time. It has quite the first round pop, but it is proving to be extremely durable. Harry Callahan would not approve. JWT, if you do convert a 1911, I would like to see your write up. I have been kicking around the idea of a .45 Super for a while now but ended up getting a new 1911 in 10mm. Mostly because of commercial ammo availability, as I don’t currently have the space for reloading equipment. It just came in, and I haven’t had the opportunity to pick it up yet. I love trying out new ( to me ) cartridges and I really like the idea of the .45 Super. May want to watch this. That was very interesting and had excellent points for the conversion. Thank you for sharing that! pfft. stupid name. all it is is an overloaded 45 ACP. why not call it +P same as 9mm? stupid. The 45 Super was developed in the 80s. I’m using .44 mag 225 copper HP at 1350 fps on deer. Effective to 75 yards at least. The aftermarket barrel was for extra chamber support over the stock correct? I believe the XDM and USP are rated for .45 Super out of the box? As their barrels have more chamber support? So . . . . the Glock 40 exists . . . . . why do we need this pistol? Because the G40 doesn’t come close to this energy level or bullet weight. I have some 45 super i made for the fun of reloading. I run them through my 1911. Once a piece of regular 45 brass made it into the mix. It split. I check my headstamps better now. The uncool thing is shooting it through a suppressor because my face felt like it had been sandblasted. As for the 10mm vs 45 super. Who cares? When did your identity get tied to to your caliber of preference? I guess I am just pan-caliber. JWT, I have a G21 that I swapped the factory barrel for a Storm Lake extended barrel with compensator cuts. A buddy said he didn’t like compensated barrels like that because they shaved lead as the bullet exited. That doesn’t make any sense to me so I figured I’d get your take on it. Any truth to that? The main reason I ask is because I’ve been contemplating setting it up for .45 Super. The chamber has plenty of support and I’m guessing the compensator should help a bit. I have never seen that happen and I’m pretty doubtful it does. 1. You warn that a stock glock 21 barrel doesn’t have a fully supported chamber. And I presume that your warning about shooting 45 super in this is more fully stated as follows? 2. If, however, you had some sort of .45 ACP super brass (thickened to super levels) then it might be ok to shoot in a glock 21 barrel? I presume this because the glock 20 is routinely shot with a stock glock barrel, which doesn’t have a fully supported chamber using 10mm brass cases. Is the 10mm case thickened so that it is fine in a non-fully supported chamber? The neck of the 10mm is stronger than the 45ACP case and designed to handle much higher pressures. Even still, reloaders such as myself have seen case bulging from full pressure 10mm loads through G20s and Colt Delta Elites.